Jeremy Seewer and Hunter Lawrence both pulled holeshots on their Suzuki’s as they helped Switzerland and Australia to impressive qualifying results at the 2017 Motocross of Nations. Lawrence would lead most of the MX2 race and ended up finishing second, while Seewer came home in third as he made his 450 debut in the Open class. Kevin Strijbos also rode well for Belgium, crossing the line in sixth position as all three riders helped their nations’ qualify with top-10 gate picks. So a very successful day for the three Suzuki World riders, helping their respective countries qualify with good gate picks for tomorrow’s main motos. With rain clouds looming, the track could change significantly before tomorrow but Seewer, Lawrence and Strijbos have all proved they have the speed to challenge up front for both individual and national glory. MXGP Qualifying Results: 1. Tim Gajser (SLO, Honda), 27:02.312; 2. Gautier Paulin (FRA, Husqvarna), +0:05.416; 3. Antonio Cairoli (ITA, KTM), +0:06.841; 4. 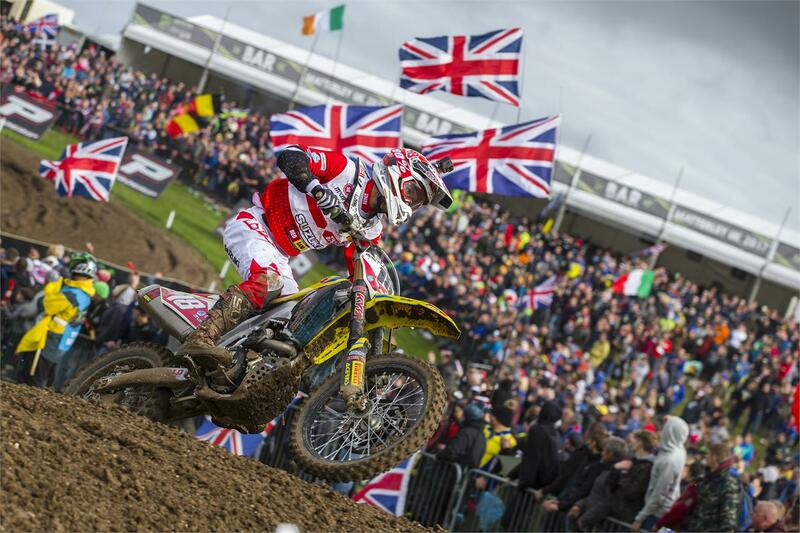 Max Anstie (GBR, Husqvarna), +0:21.486; 5. Jeremy Van Horebeek (BEL, Yamaha), +0:31.752; 6. Evgeny Bobryshev (RUS, Honda), +0:35.494; 7. Dean Ferris (AUS, Yamaha), +0:38.418; 8. Arnaud Tonus (SUI, Yamaha), +0:39.206; 9. Cole Seely (USA, Honda), +0:42.268; 10. Glenn Coldenhoff (NED, KTM), +0:42.872. MX2 Qualifying Results: 1. Zachary Osborne (USA, Husqvarna), 27:26.409; 2. Hunter Lawrence (AUS, Suzuki World MX2), +0:01.129; 3. Brian Bogers (NED, KTM), +0:24.169; 4. Jorge Prado Garcia (ESP, KTM), +0:25.359; 5. Thomas Kjer Olsen (DEN, Husqvarna), +0:27.304; 6. Darian Sanayei (PUR, Kawasaki), +0:30.267; 7. Tommy Searle (GBR, Kawasaki), +0:43.731; 8. Christophe Charlier (FRA, Husqvarna), +0:46.334; 9. Valentin Guillod (SUI, Honda), +1:12.973; 10. Harri Kullas (EST, Husqvarna), +1:13.996. Open Qualifying Results: 1. Jeffrey Herlings (NED, KTM), 26:40.776; 2. Romain Febvre (FRA, Yamaha), +0:28.669; 3. Jeremy Seewer (SUI, Suzuki World MXGP), +0:35.853; 4. Kirk Gibbs (AUS, KTM), +0:43.400; 5. Dean Wilson (GBR, Husqvarna), +0:45.274; 6. Kevin Strijbos (BEL, Suzuki World MXGP), +0:59.581; 7. Thomas Covington (USA, Husqvarna), +1:05.754; 8. Graeme Irwin (IRL, Suzuki), +1:09.555; 9. Tanel Leok (EST, Husqvarna), +1:12.723; 10. Alessandro Lupino (ITA, Honda), +1:27.188.